The Burton Overy Women's Institute meets on the second Tuesday of the month. Locations of the meetings vary. We were saddened to lose our oldest member Jean Brown in January, she had been ill for some time. Always a keen member of the Institute, Jean was involved in every aspect of WI life, never missing a meeting until her last illness, and always ready to volunteer her help. She is greatly missed. The January meeting was preceded by lunch. This was intended to be in December but bad weather forced us to postpone the meal. Jane Chandler did us proud with a splendid late Christmas lunch, complete with candles and crackers, thank you Jane. Lunch was followed by a talk from Duncan Sims entitled "Most people have got the wrong kind of Will - don't let it be you" a very informative and amusing speech. The February meeting, also in the afternoon, was on the 13th. Members spent an enjoyable time decorating cupcakes for Valentines Day. This was also arranged by Jane. In March we reverted to evening meetings. Several members brought along an item which was special to them and told us why they loved it. 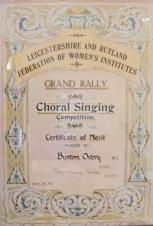 The April meeting will be on the 24th, not our usual date but as Burton Overy WI was formed 100 years ago on the 25th April 1918, we chose the nearest Tuesday. Members were presented with a framed group photograph taken by Graham Thompson. Richard Adams brought slides set to music, his theme was "Memories are made of this." it was a delightfully nostalgic presentation. The evening ended with champagne and a beautiful birthday cake made by Jane Chandler. At our May meeting, after discussion we will vote on the resolution Mental Health Matters. Our decision will go to the National Annual Meeting in Cardiff held in June. After the vote Ian Milne will give a talk on Kenya. In June Jackie Palmer gave a flower arranging demonstration and everyone was helped to make their own floral buttonhole. Our outing in July was to Barnsdale Gardens followed by afternoon tea at Barnsdale Lodge. It was a very pleasant afternoon. Margaret Pollard hosted the August meeting at her home, where members brought food for a Bring and Share supper. In September our speaker was Anne Bloor who told us about receiving Maundy Money from the Queen. It was a very interesting talk, and Anne looked very elegant, wearing the outfit she had worn on the day. Our October meeting was spent making decorations for the Christmas tree we intend entering in the Festival in December. There was a lot of laughter and chatter! November will be the AGM followed by a quiz. In December our Christmas meeting will be at the home of Alison Tasker.